There’s nothing new here, but the chart below happened to show up in a new Pew report on the rise of Americans with no religious affiliation, so I thought I’d pass it along. 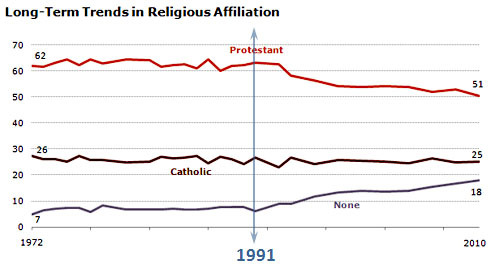 As you can see, religious affiliation held fairly steady until 1991, but in the twenty years since then the number of people reporting no religion has more than doubled. This has come almost entirely out of the ranks of Protestants. We all have our own guesses about why this might be, and obviously this has been a common phenomenon throughout the advanced economies of the world. In the American context, I blame the rise of Jerry Falwell and the politicization of religion for the drop in the number of people who want to call themselves Protestants. It’s just become a toxic label for a lot of people who aren’t rabid social conservatives, especially among the young. The Pew report has more on this, and Ed Kilgore has some comments too.